Christian Davis - At their April 25, 2017 regular meeting council for the MD of Pincher Creek heard from Patton Park Society President Kathy Rast. Patton Park is located in the hamlet of Lundbreck. The society, which was incorporated November 30, 2015, was organized to revitalize the park for the use of a number of stakeholders, including Livingstone School and residents of Lundbreck and the surrounding area, for multiple uses. Those uses include various sports activities including soccer, track and field, baseball, frisbee, horseshoes, skateboarding, and golf, as well as other activities such as walking, picnicking, and the annual Lundbreck Corn Fest and similar events. A revamped playground is also part of the plan, and is already in progress. 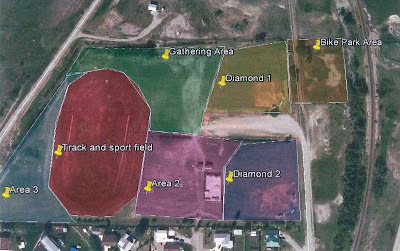 Rast asked council to consider helping fund an irrigation system for the track and field area, which is planned to be installed this year, to be completed by the end of summer. According to Rast, "Our hope is that the revitalization of the park will bring more people to our community and provide a space of beauty to enjoy with students, friends and family." "Currently, we are trying to raise $30,000 in funds to assist with our goals and work in partnership with the MD to make continued improvements to the park. Since January 1 of this year we have raised close to $10,000. We plan to use these funds to push the project into its next phase, which would be to extend the irrigation system to other areas of the park, repair the baseball diamonds and create picnic and garden areas. Approximately two years ago the grade 6 class of Livingstone School created plans for Patton Park and had the whole student body vote on which plan they liked the best. Those projects were presented to council at that time. The students continue to be interested in the progress of the park." After many meetings the following priorities were established as "Phase 1" of the project. M.D. to provide and haul the necessary top soil for the sports field from the stockpile adjacent to the Lundbreck lagoons. "The background work has been completed for the irrigation system. The area has been mapped by an architect and an irrigation plan with costs of materials and estimated labor has been completed. We are requesting funding from the MD to begin priorty 1 irrigation installation as tendered. We would like this project to begin in May of 2017 and be completed by July 1, 2017 with top soiling and seeding to follow. Please note that the Patton Park Society volunteers are committed to screen, level and spread the topsoil and complete the seeding once the topsoil has been delivered. Finally, we would like to request the replacement and repair of the dugouts by August 1, 2017." "We are grateful for the partnership the MD has formed with us and the financial assistance you provided in the fall of 2016 for the playground and installation costs. We hope that you will find this project worthy of your assistance at this time." Council queried Rast about details of the various costs associated with the project and possible liability issues related to work by volunteers. The matter is now expected to be part of the next regular council meeting's agenda for further discussion and possibly a decision by council. At their August 23, 2016 meeting council agreed to initiate the project to install used playground equipment in the park with $21,904 in funding from the MD's Public Reserve Trust Fund.